Thanksgiving Weekend 2013: Snow, Good Winds, and Nice Rollers up to Head High. 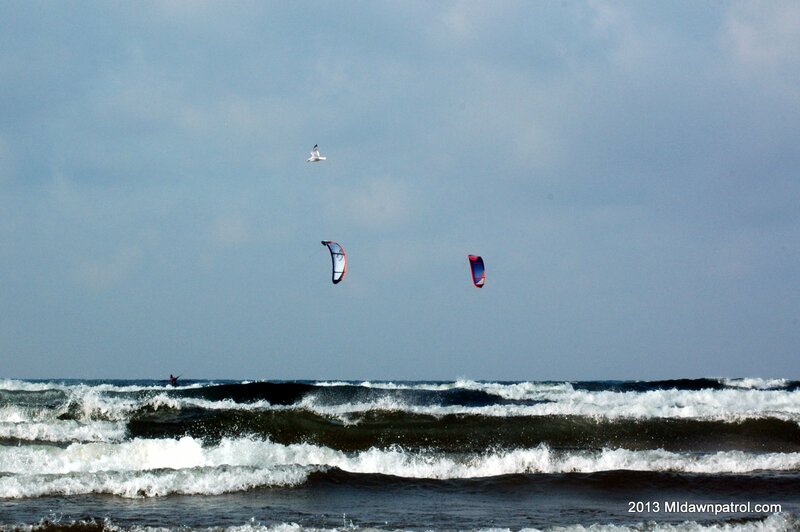 Another great Thanksgiving weekend and to be thankful for good winds and waves. 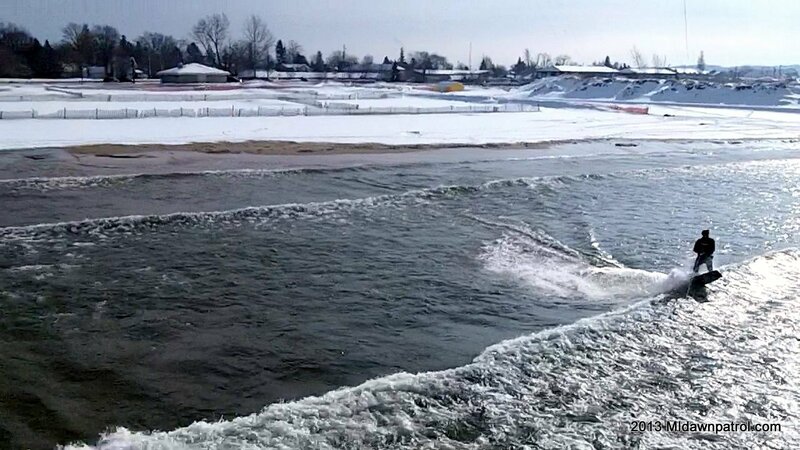 We kited Ludington and Big Sable earlier this summer but didn’t really get the full Stearns Park experience as the conditions weren’t right for big waves. 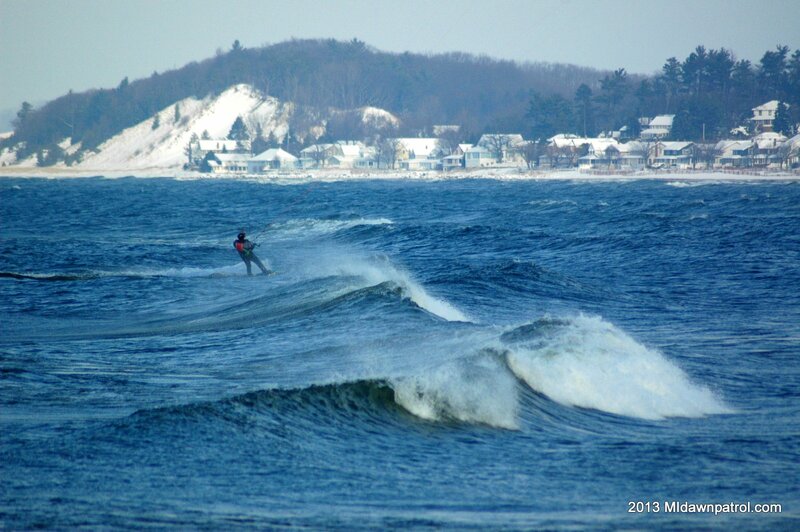 This past Saturday the conditions lined up perfectly(except for the temperature and snow) for Ludington. Kiteboarding after work is no longer an option now that it starts getting dark around 5:00 so that just leaves the weekend to enjoy Pure Michigan. The forecast had been looking good for Saturday after Thanksgiving. Jetty and I talked about driving to Frankfort but opted for Ludington due to the forecast for a southwest wind direction and sunnier skies. 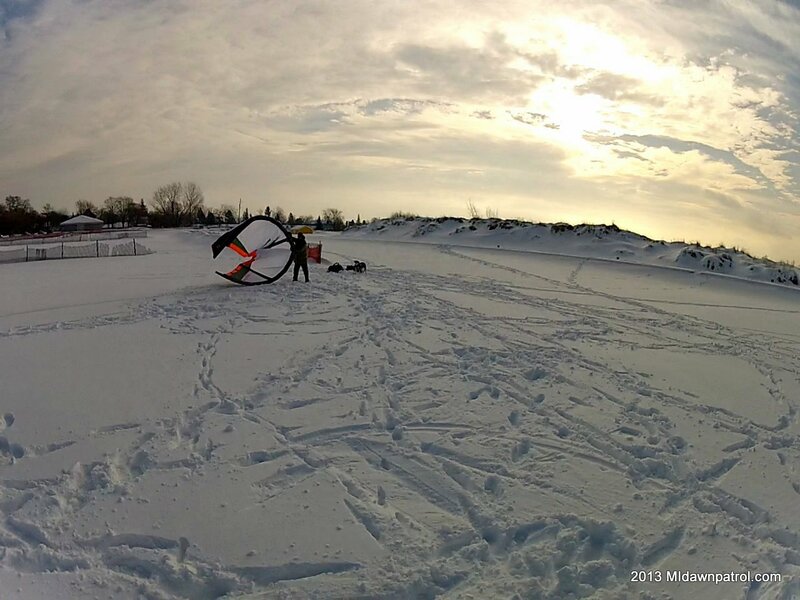 Tough Decision whether to Go Snowkiting or Hit the Water! My Dad, an avid Stand up Paddle Boarder, was interested in checking out the surf in Ludington so we rode down together to meet up with Jetty. We arrived around 10:00 AM. The wind was slightly side-off near the pier but steady so after setting up our gear on 6-8 inches of snow we threw up the kites and got on the water. The waves on Saturday were simply incredible. Long, steep, and smooth with flat water in between. My dad was on the sidelines taking pictures that day but I’m sure if it was a little warmer he would have joined us on the water. I was on my 11m and was slightly underpowered with wind speeds in the upper teens and low 20s. Not quite enough wind for me to hold my ground so about every half hour I’d have walk my gear upwind to the pier. After riding for a couple hours and walking my kite upwind several times I was tired and decided to call it a day. I landed my kite ay the north end of the beach and started walking back. As luck would have it the wind picked up another 5 knots which made my last upwind hike even more exhausting and would have been perfect conditions for me to ride. 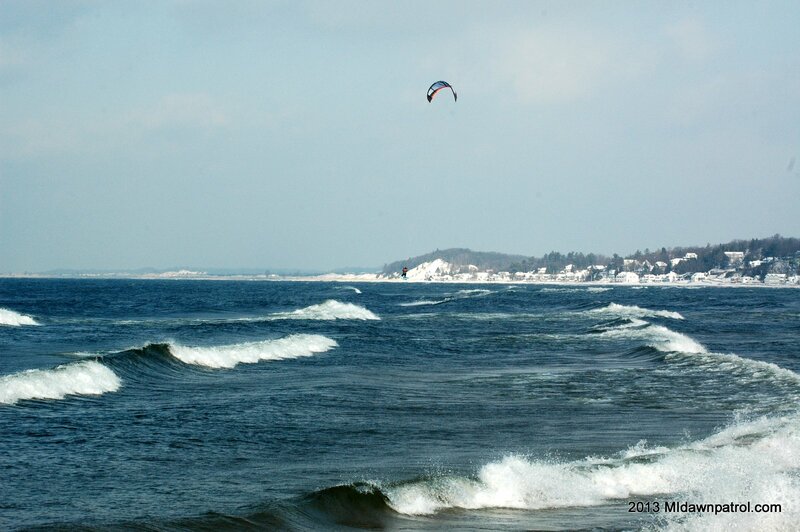 A few lessons learned is that Stearns Park in Ludington is a great place to ride on a wavy day with a south to south southwest wind direction. Like many locations along Lake Michigan with great waves the pier has an elbow that generates some real nice long rollers. 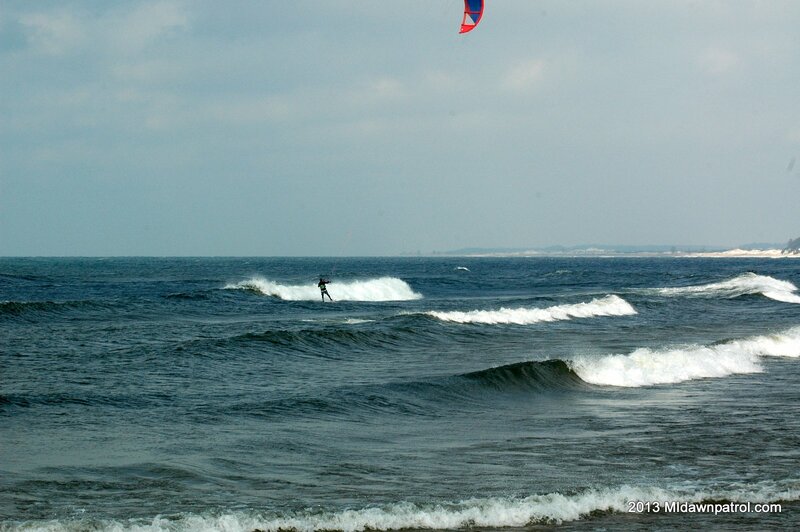 When the wind is out of the southwest the waves get a little choppier but would still be rideable on a SUP or surfboard. I’m definitely looking forward to the next time(next year?) I get to ride here. 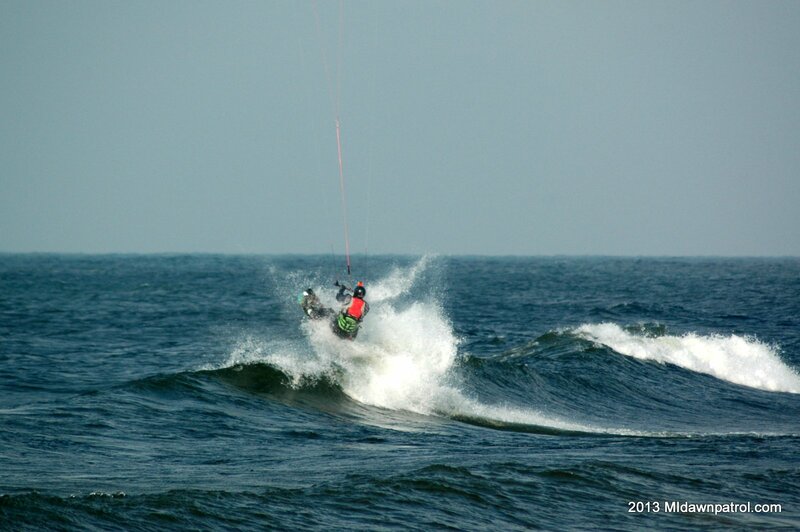 Michigan Dawn Patrol is kiteboarding and watersports photo and video blog focused on Michigan. Subscribe to be notified on new posts and consider joining and post your own experiences from the third coast.